Rep. Andy Josephson - I answer to you! submit your 175 word letter to the Anchorage Daily News via e-mail letter@adn.com, or fax them to 258-2157, attn: letters to the editor. Being home in Anchorage has been great. The downtown office is coming together, so please come by any time to say “Hi” (716 W 4th Ave Suite, 390). Throughout the past two weeks, I have had the pleasure of attending several community events as well as the opportunity to study some major projects directly affecting our community. Congratulations to our Anchorage School District high school graduates this week. I am proud of you all! The Northern Access to the University and Medical District Reconnaissance Report has been a very good resource to learn more about the road project also known as the Bragaw Bypass Extension. Although this project has a noble goal of alleviating the traffic pressures in U-Med, I am concerned about its ability to avoid harming the many trails and natural spaces in the area as well as shifting traffic problems to other parts of the district. I spoke with the Department of Transportation and will continue to be very involved in the project as it develops. The most up to date piece of information is that the project team hopes to narrow the four routes under consideration to one within the coming year. 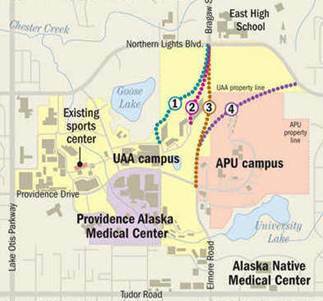 For more information listen to this airing of “Hometown Alaska” where I speak with University of Alaska officials and many members of our community about the positives and negatives of the project. If you oppose this project, please write, call, or email Governor Parnell and ask him to veto the $20 million funded in the capital budget. 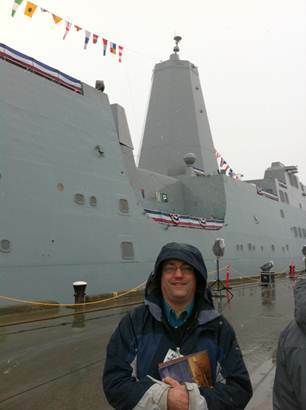 I was honored to attend the commissioning of the USS Anchorage. The dedication and respect the naval personnel showed to the city throughout their stay in Anchorage was a testament to the United States military. 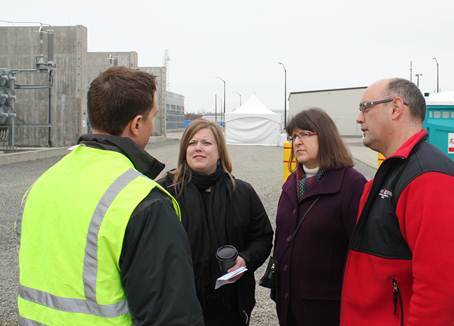 I was also happy to take part in the groundbreaking of the new Chugach Alaska power plant in west Anchorage. The plant has a new steam turbine that utilizes the concept of co-generation (funnels waste heat from natural-gas turbines to heat water that spins the steam turbines) more efficiently. The plant is predicted to reduce Chugach Natural Gas consumption by 3 billion cubic feet a year, saving customers about $15 million annually. The “topping out” ceremony of the new UAA Alaska Airlines Sports Arena was another event I had the opportunity to take part in. “Topping out” is the term ironworkers use to indicate that the final piece of steel has been hoisted into place on a building. 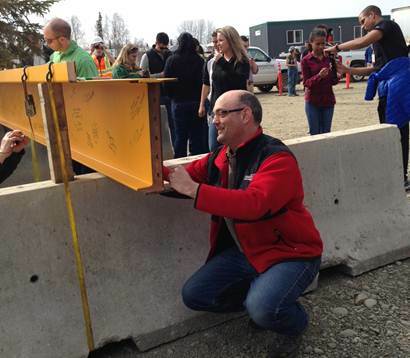 Although I have concerns about the size of the new structure and its lack of green spaces, the magnitude of the project is incredible and demonstrates the abilities of the highly skilled construction and ironworkers of Alaska. 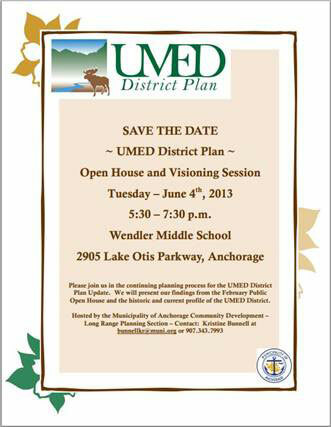 U-Med District Plan Open House and Visioning Session: Bring your ideas and opinions about our community to Wendler Middle School at Tuesday, June 4th from 5:30 to 7:30pm. This is a great opportunity to get your questions answered about road and other development projects in the area. 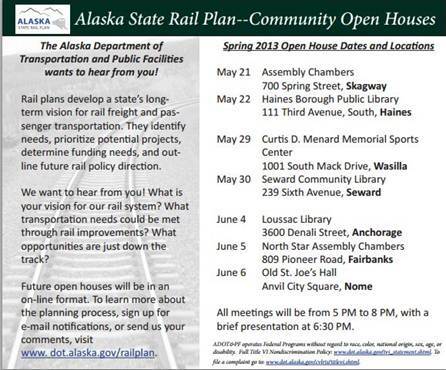 Alaska State Rail Plan Open House: Join the Department of Transportation in discussing the state’s long-term vision for rail freight and passenger transportation. Get your questions answered and provide input into future rail policy direction. The open house is June 4th at the Loussac Library (3600 Denali Street). 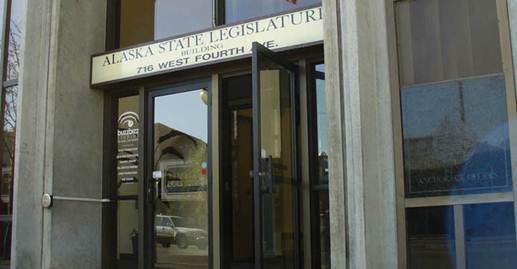 As always, if you have any questions or concerns please contact me on my personal cell phone which serves Midtown, University, and East Anchorage residents (575-ANDY (2639)) or on my office phone at 269-0265.